Camping Villaggio Colombo is a luxury camping site set on the side of a terraced hill overlooking the historic seaport of Andora. From this panorama vantage point, you have a stunning view of the blue water and beaches of the Italian Riviera, a brief 3 km away. This family-friendly luxury camping site has a grassy equipped children’s playground and separate paddling pool. A mobile home bookable through LuxCamp provides the conveniences of home nestled in 25,000 square metres of parkland. 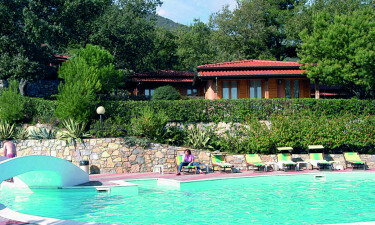 Delight the whole family with a camping holiday on the renowned Italian Riviera. Villaggio Colombo camping luxury has activities for young and old including an aquatic area and onsite tennis courts. Sunny beaches and breezy hilltop setting — you can’t ask for anything more. Why choose Camping Villaggio Colombo? Camping Villaggio Colombo has so much to offer for a camping holiday. Here are a few features you won’t want to miss. 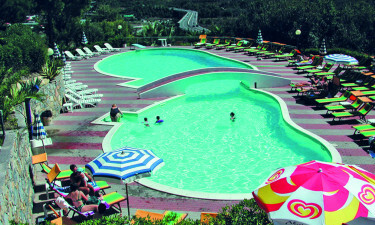 The two swimming pools are divided with an arching bridge and surrounded by a spacious sun terrace with deck chairs and umbrellas. A separate paddling pool is provided for the splashing enjoyment of the youngest campers. Andora Beach is a short 3 km away from Villaggio Colombo campsite. Andora forms part of the Liguria coastal strip of the Italian Riviera, playground of the rich and famous. Plan to spend at least a day or two enjoying the well-developed beach area of the resort town of Andora.